The artwork of the popular ice cream Melona and the joke based on it—Bring Me a Melona When You Come Back—was introduced via social networking services (SNS), gaining popularity among the young. 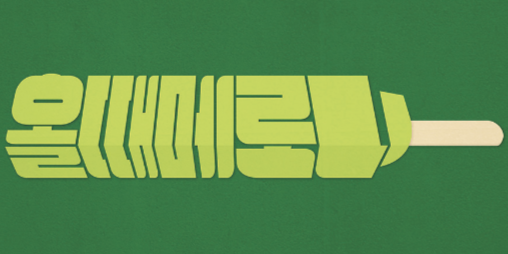 For many, it was the first introduction to artist Park Ji Hoo, who has pioneered a unique type of artwork that combines typography and illustration. Collaborating with famous brands and organizations like Dunkin’ Donuts, Volkswagen, and the Ministry of Health and Welfare (MOHW), Park displays his wit and delivers his messages of encouragement using Hangul as his primary medium. Hangul is literally everywhere in Korea; one cannot imagine life without it. However, many regard it as merely a medium of writing and speech. 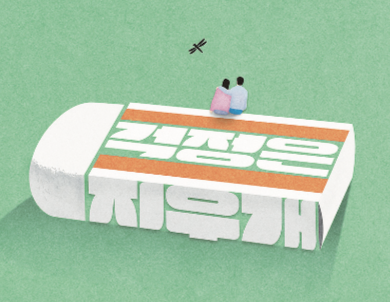 However, a new form of art – typography, which is the art of arranging the letters in an innovative way – has emerged to increase the appreciation of Hangul. As Hangul Proclamation Day nears, to shed light on the forgotten importance of the characters of Korea, The Granite Tower (GT) met artist Park Ji Hoo, who breathes life into letters with his artistic talent. GT: How did you come up with the idea of creating such a unique form of art? Park: After graduating from college as a design major, one day, I went out to see an exhibition. The artist must have put great effort into every artwork displayed, but the visitors spent only a few seconds in front of them without fully appreciating them. I started to devise a way to grab people’s attention for a long time. I originally had interest in typography as well, so I came up with an idea of drawing something that would encourage people to try to figure out the message within. I may not be the first to combine typography and illustration, but I am almost the only artist in the field now who has built a career out of it. GT: What kind of process do you follow when creating new art pieces? Park: Whenever new ideas come to mind, I write them down right away. When I decide to work on a new drawing, I pick an idea from the list. Even now there are plenty of ideas on that list, but I am quite lazy, so there are still several untouched ones. However, there are some items that were removed even before they saw the light of day. For example, this year comedian Yang Se Hyung came up with the design idea of a pair of slippers and it became a big hit. The quote “Knock, knock, excuse me. It’s us, slippers,” was on my list as well, but because he proposed it first, I erased it right away. GT: Please introduce us to one of your favorite or most meaningful works. Park: The inspiration for the piece “Don’t be Discouraged” came from a phone call with my father when I was having a hard time. At the very start of my artist career, my father had a surgery for a back injury, but I could not be with him because I was in Seoul. At that time, I was downcast because of my small income and my tough start as an artist. I should have been supporting my father, but on the phone with him, he told me that he was proud of me and that I should not be discouraged. Thinking of his advice on the way home, I wrote down the phrase “don’t be discouraged” on my scratch pad. I finished the piece as soon as I arrived home. I drew a medicine envelope and wrote the phrase in the shape of a green cross. Next to it, I portrayed my father handing me the envelope. The completed piece and the kind words of my father still motivate me and affect my strong work ethic. GT: Have you had any memorable experiences participating in a fair or an exhibition? Park: My first but unofficial exhibition took place in a gallery cafe, where art pieces are used as part of the interior design. I displayed my drawing of Iron Man and the members of the television show Infinite Challenge. There, I met my first fan, who came to the cafe just to see my drawings. I still keep in touch with him, and he eventually became an artist as well. It is thus interesting that I recently collaborated with Dunkin’ Donuts because the fan brought me those donuts when we first met. GT: What are the things you care the most about when drawing your pieces? Park: Except when working on contracted designs or collaborations, I do not care much about readability. If I start thinking about that, my pieces will be too easily understood, which goes against one of my goals of making people take a closer look. I am also trying to establish my own style of art. I want my art to be unique so that if someone imitates my work and style, people will recognize that I am the original source. GT: What is the main message you intend to express with your artwork? Park: I usually try to say what I want to say to the world, as rappers do through their lyrics. I pursue art that is true, meaningful, and cool. That is, in my perspective, something that pursues two different ideas at once. I am not a type of person full of humor, so at least with my art pieces, I use a lot of plays on words to gift people with delight. At the same time, I try to convey words of consolation that would give people hope when they are going through hard times. Delivering encouragement in a wrapper of wit is what I desire to do as an artist. GT: What are your plans or goals in the future as an artist? Park: Most of my previous works are on flat paper, but currently I am working on animating them. I also want to bring my work to life in solid figures. For instance, I am seeking to blend my artwork with the design of chairs, couches, and ceiling mobiles. My dream is to break the boundaries of flat surfaces, and I incessantly struggle to expand the spectrum of my own art space. Starting with videos and real objects, my craving for challenge as an artist will never end.